Well, she’s done it again! Emily has created a whole collection of masculine-inspired patterns in her new book Geared for Guys, with a fabulous contribution by QuiltDad – John Adams. I’m excited to be a pit stop on Emily’s blog tour so that I can share her new book with you. Geared for Guys has 8 quilts designed especially for, well, guys. Emily also has very helpful information about color theory and fabric selection when working with a masculine color palette. It’s excellent. One of my favorite quilts in the book is Switchback (above). I watched Emily piece this particular quilt when we were at the same retreat last November. The fabrics and colors are gorgeous and I love the Missoni-inspired zig-zag look. 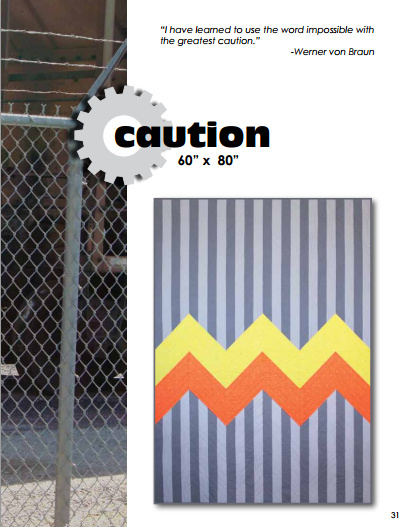 I also love the Caution quilt – another different take on the current chevron trend. Busy Emily is on her way to quilt Market as I type (literally) to debut her latest fabric collection, Shore Thing for Michael Miller. If you loved Going Coastal last year, you will love Shore Thing. And there’s a new version of that adorable madras plaid print, in case you missed out on that one last time. If you are looking for some great guy-quilt inspiration, this book has got it. Geared for Guys in hard copy is available for pre-order for $14.75 in Emily’s etsy shop or available right now as a PDF ebook in case you want to get started on the perfect Father’s Day present. Emily is also giving away a printed copy to you readers! All you have to do is leave a comment on this post. (One per person, please.) Winner will be picked next Monday, May 21. GIVEAWAY CLOSED. If you want another chance to win, you could visit yesterday’s pit stop on the Geared for Guys blog tour, Amy’s Creative Side, or tomorrow’s stop, Blue Nickel Studios! I am always on the lookout for masculine quilts. It would be super to have this book for inspiration. Thanks for the chance. Always wanted to make a quilt for my son, but never found anything that would appeal to him. Great idea! it&#39;s only boys in my family, this would be great to have to make quilts for the boys in my life :)<br />thanks for the giveaway! I love the new trend in the craft world: to include items for men. This book is sure to become a trusty resource. this is such a great concept for a book! Love that quilt you pulled out of the book…beautiful! Thanks for sharing a copy!! What a great idea – quilts for guys! Thanks for an opportunity to win a copy of this fabulous book. I love seeing the ideas for quilts for guys – they are few and far between! Thanks for the chance to win! This is a great idea for a book. Masculine quilts can be difficult to make; the inspirations in this new book could set of a trend of more masculine-type quilts in blogland! I am surrounded by boys so clearly I need this book! Thanks so much for the giveaway — the book looks great! I could definitely use this book too :). I have six sons! Thanks for the giveaway!! Wow…love the switchback quilt, would love to win the book…definitely going on the I want list! How fun, thanks for the chance! I&#39;ve never bought a quilt e-book, but I am going to buy the latest Fat Quarterly and give it a try. Would love to make one for my little guy! This looks like such a great book. I would love to win. I&#39;d love to win this book, I&#39;ve been dying to make a quilt for my boyfriend for ages but just can&#39;t seem to find the right pattern. These look perfect! thank you! id love to have a copy of the book!<br />m. There are so many quilts that tantalize me in this book – make me for your (brother, uncle, niece&#39;s husband, …). Thanks for the chance. I&#39;d love to win a copy of this book. 🙂 I am looking for the perfect quilt pattern to make for my son, so the timing is perfect. The top quilt is gorgeous! Thank you for the chance to win a copy! Wonderful patterns! I have lots of guys in my life and would love to make them each a quilt. Thanks for the chance! Very cute (in the manly sense of the word) patterns! My husband would love it if I won this book! Thank you for the chance! i am dying to get my hands on this book!! thanks for the chance to win! What a great idea for a book – and the patterns look wonderful. I&#39;ve loved all the sneak peeks were getting of this book. It all looks fantastic! I have been eyeing this book and would love to win! I&#39;d love to win this book! What fun to have some masculine options. Making quilts for guys is hard! maybe I need a book to inspire me!? I love love love that Switchback quilt!! I have two boys getting ready to move in with each other and I think they need a version of that! I do get stuck trying to come up with some ideas for &quot;guy&quot; quilts, they don&#39;t all like to fish or cheer for sports teams! Thanks for the review and a chance to win Emily&#39;s book. In any event it&#39;s on my wish list now at Amazon. This book looks great! Thanks so much for the chance to win! I&#39;d love to win a copy of the book–I&#39;ve got one cutie gearing up for college so I&#39;d like to make him a quilt to take with. Cool guy patterns are hard to come by–thanks for the giveaway! That book is a great idea!!! There really is a lack of guy quilt patterns out there. I&#39;d love to win! Would love to make some of the quilts for my boys! What a wonderful idea for a book. Thanks for the chance to win. What a great idea for a book! I love the quilt. Thanks for the giveaway. Looks like a great book! I&#39;d love to make a quilt for my husband. I&#39;m excited to see all the patterns in this book! Thanks for the opportunity to win! I love the idea of this book! Switchback is such a great quilt! I love it! My husband&#39;s been after me to make him a quilt. I&#39;d love to have this book! So far, I love all the quilts that I&#39;ve seen made from this book. Thanks for the chance to win a copy! What a great book! I love Switchback and my brother wants me to make one for him to take on his road trips. he says it reminds him of the mountains he loves so much. Thanks for the chance to win. I love that zigzag quilt. It reminds me of the Indian blankets my parents had when I was growing up. I think it is great to have more ideas for &quot;manly&quot; quilts. I am making one now and I wish this book had been out before I started. I really like that Caution Quilt and think Son #3 would too. Quilts especially for guys! what a Great Idea!! I love this! Thanks for the opportunity to win a copy! I would love a chance to win this book! Thank you! Being the only women among 3 men in my household, it would be nice to have some more masculine quilt options. Thanks for the opportunity. Awesome give away, I would love to have this book, Love Emily&#39;s patterns! Great giveaway, Amy! I love that quilt, and I am DROOLING over that new fabric collection! Can you sneak some into the book when you pick me to win? Ha!! Thanks for the chance! A book we have needed for a long time! Husbands, brothers, nephews, they all need quilts! Thank you for the review~ this would be a great book for the guys in my life! thanks! I really like that chevron quilt you showed. My favorite so far of the quilts I&#39;ve seen from the book. Thanks for the chance to win. I&#39;ll have to add the book to my shopping list! I have a son and husband that I&#39;d like to sew for a lot more! Even though they are &quot;geared for guys&quot;, I really love the quilts I&#39;ve seen in this book. Thanks for the chance to win! Hello, This will be a great book to have, just yesterday my son asked if I could make him a quilt. I have never made one, but someday I hope to make one for all 4 sons. Thanks for the chance to win. So excited to check out the book! Thanks for sharing! Its so great to see inside the books as I have to order books online. With two boys I am always looking for quilts with a masculine feel, so &quot;Geared for Guys&quot; would be a perfect addition to my sewing and quilting library. I have three grandsons and would love boyish quilt ideas. Sadly, I&#39;m getting to the point where I just have trouble deciding what to do when a guy needs a prayer quilt. Could certainly use some versatile new ideas! Oh this book would be so nice for our quilt ministry, the guy quilts are so hard to pick patterns for! sounds like a great book, I like the sample quilt! the quilts in this book are just so great! Thanks for the chance to win the book! This is a great book! I can&#39;t wait to see the rest of it…that is, I&#39;ll wait to see if I won the giveaway, and if I haven&#39;t, I&#39;ll hurry to my favorite quilt shop to buy one! Thanks for the chance to win! Thanks for the chance to win. Love pattern shown. I like Switchback as well, although I would never be able to pick out the right colors. Maybe I will have to check out the book. I love the Geared for Guys book! I&#39;d sure love that for inspiration for the men in my life. Great idea,a book of quilts for guys, thanks for a chance. I could definitely use this book. My younger brother is the hardest person to shop/make for! That looks like a great book for guy quilt patterns! Great patterns in this book. Love the new fabric Shore Thing too. I love the look of this book &amp; think it&#39;s such a brilliant concept. And the quilts are amazingly gorgeous – in a masculine way, of course! Thanks for the giveaway. I think I could get a lot of use out of this book! I love that Switchback quilt. I want to win! I need inspiration for my dad. I love the Switchback quilt and hope I win the book! WoW! I love Switchback! I would love to make one for my DH. Thanks for the chance to win! Hubby is always complaining that he doesn&#39;t have his own quilt. I&#39;d really love to win this awesome book! I think Switchback is my favorite design of all that I&#39;ve seen on the blog tour from this book. Thanks for the chance! My husband is feeling jealous of all the quilts I have made for friends. He would love his very own guy quilt. This book looks like just the one I need to inspire me. This book looks awesome, I would love to win it. Thanks! Who would not want to win this book…. coming up with quilts for guys is not always easy. What a needed book! I would love to win it. Thanks for the chance. Finally, some great patterns for guy quilts! I would just love to win this book. Oooh, nice giveaway! Looks fun! Been dying to get my hands on a copy – thanks for the chance! I love that switchback quilt! This looks like an awesome book! These are such great patterns for the men in our lives- thanks for the chance to win! Would love to win a copy!! Would make great gifts for the men in my life! Love Going Coastal and Shore Thing looks like another great fabric line! Thanks for the chance! Good to see patterns for the masculine–don&#39;t see many of those! Oh my goodness! I would love to have this book! Thanks so much! I would love to win this book. Those quilts are awesome! I love the Switchback quilt too. Thanks for the chance to win. I would love to win a book. I spy several quilts I&#39;d love to make my husband! I love the look of these patterns. Switchback and Gamer are both fabulous! My husband was reading over my shoulder and said, &quot;Wow, I like that quilt.&quot; I&#39;m sold. He needs a switchback quilt now! It would be awesome to have a copy of this book. Thanks! Thanks for the oppotunity to win! Looks like a great book, perfect for all the guys graduating and headed out into new directions! I am so inspired! GUY quilts! What a great idea. I would love to win this book. I love the Switchback quilt. The design reminds me of a Navajo blanket. I would love to win this book. Thanks for the giveaway. I would love to win this book. I am always trying to come up with quilt colors and patterns for guys. What an awesome book! I always struggle with quilts to make for my husband and my 2 sons. This will be the perfect solution! Thanks for the giveaway. I also love Emily&#39;s fabric line. I have never thought about doing a quilt for the guys in my life (husband and son) but know they would love one. This book would be a great help! I love that Switchback quilt! What a great book, would love to win! Thanks for the chance! What a fun quilt book—I would love to make one for my husband! Thanks for the chance to win! That switchback quilt moves! What a great idea to do a book of quilts with guys in mind. Thanks for the intro, I hadn&#39;t heard of this book. Would be fun to win, I love the quilts. My dad turned 80, and I&#39;d love to find a good guy pattern to make him a quilt. I LOVE that pixelated chevron! (There&#39;s probably a different name for it) Thanks for the giveaway!!! I can always use some help coming up with new ideas for quilts that a man would like! Great giveaway! I would love to be entered for the book! I missed the boat on Going Coastal so I am determined to get my hands on some Shore Thing to make my beach blanket. This book looks fabulous! I would love to win a copy of this! Being the only girl in a family of 5, I need all the boy ideas I can get! The blog posts about this book make me so anxious to get it — such great designs! I&#39;m also looking forward to the new fabric line since Going Coastal was so cool. Quilts for guys!! I need it!! Can&#39;t wait to pick it up! I would love the chance to win this book – it looks like it has some really great patterns. Love Caution!! Thanks for the chance to win, Amy! It looks like such a fun book! Oh I am in love with that book! Some great ideas! I am loving all the quilts in this book! I&#39;d love this book. can always use new ideas for manly quilts. I found the greatest Dr Who fabric on Spoonflower and am now looking for the perfect pattern. Maybe it&#39;s in this book! Smart idea! Would love this giveaway! From your review I can tell this is going to be an instant hit and and awesome book. I love these quilts. Maybe they are geared for gals, too! I would love to win this this book. The men in my family would love a masculine quilt. All boys in this house. The book would be very happy here! I would just love a book of quilts for guys as there are several males I would love to make a quilt for! Thank you for the =chance at the giveaway! I&#39;m dying to get my hands on this book! Thanks for the chance to win it! This would be great for Xmas quilts for my hubby and dad! A very good idea. I want already a long time to make a quilt for my son , but it is not easy to find a pattern he likes. This book is awesome! I love some of the designs and my son wants the &quot;Gamer&quot; quilt for his bed. It is always cool to find ideas for the guys. That is a great favorite, I like it too! I also like the Gamer quilt. There are a lot of great designs. I too love the switchback pattern. Something that will appeal to my boys other than civil war prints or appliqued sunbonnet sam&#39;s.
Wow! This is such a perfect opportunity! My only son has recently asked for a quilt for his new home and I&#39;ve been racking my brain with color schemes and design ideas for him so this book &#39;popping up&#39; is ideal! I would love the chance to win it – thank you!!! I&#39;ve got a half yard set of Joel Dewberry set aside for a quilt for my hubby. Several of the patterns are calling my name! I&#39;d really like to make Switchback – just need the book!